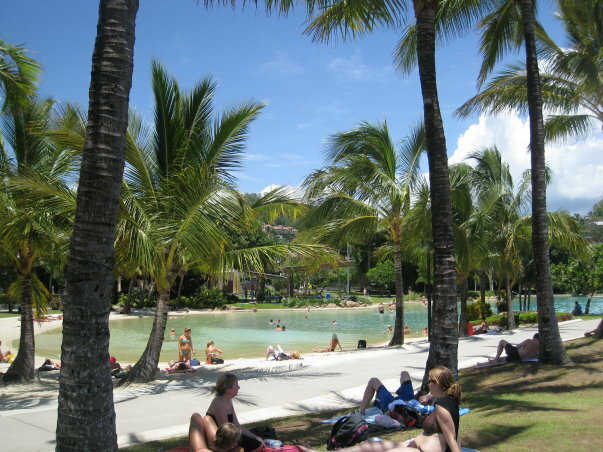 After Fraser, we headed on up to Airlie Beach. We had a hostel booked as part of our Whitsundays package and so decided to ditch the tent for the comfort of a bed. 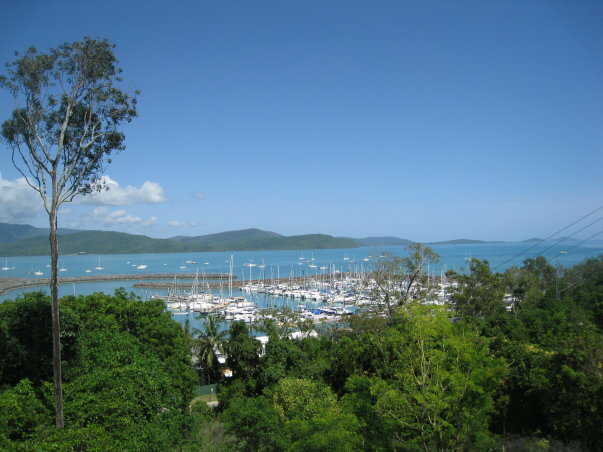 Airlie mainly serves as a stopover location for travellers coming back and forth from the Whitsundays, so there wasn’t all that much to do there, other than head on down to the lagoon for a swim, followed by drinks in the ‘town’ in the evening. 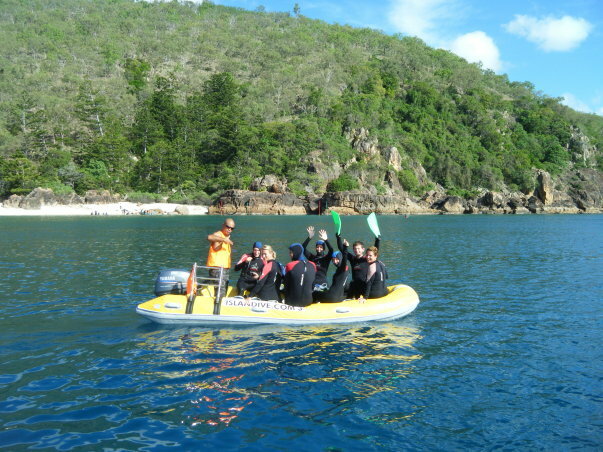 During the day, we would stop off in one of the bays whilst half of the group would head out scuba diving – Rich included, and for those who didn’t dive, we would don our ‘stinger suits’ to protect us from the Irukandji (deadly jelly fish prominent in the waters surrounding Northern Queensland) – and head out for an afternoon of snorkelling. Back on board, we would all head to the Jacuzzi where Marianne – our chef, would ply us with snacks whilst she got to work on dinner. It was a fabulous two days, topped off by our final stop – the beautiful Whitehaven beach. 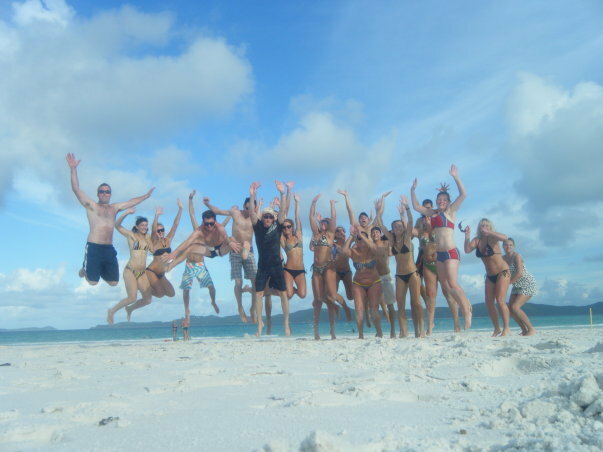 The pure white sand was so fine, the crew warned us not to take our cameras on the island and instead, Marianne brought a disposable camera to get some group shots.. The whole trip was perfect and we arrived back on dry land feeling thoroughly revitalised and ready to head on to Agnes Water and 1770 for a very brief stop before carrying on to Magnetic Island. 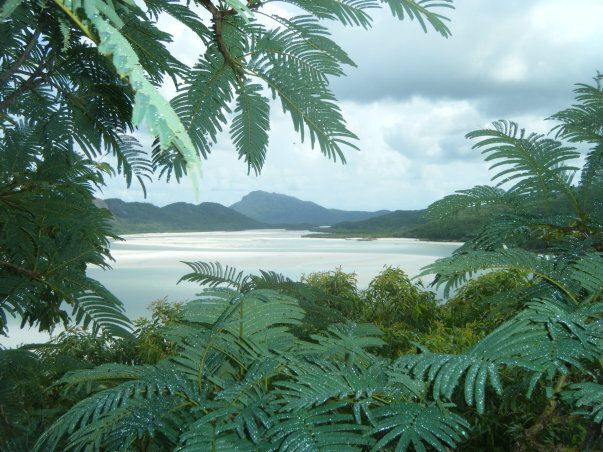 We bumped into the girls from Fraser Island once we got back from the Whitsundays and found that they were also heading up to Agnes Water (much to my irritation). Rich and I (well, mostly me) tended to do a bit of research before heading to a new location, booking at least one night’s stay in a hostel that had good reviews – we mainly used HostelBookers or Tripadvisor. This time however, I waited to see where the girls were staying and booked a different hostel down the road. We still visited them most days, but at least I didn’t have to put up with their non-so-subtle flirting 24/7. 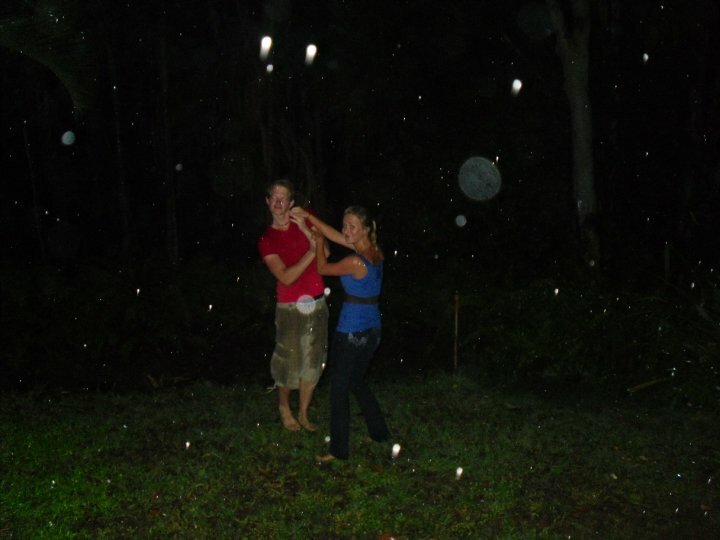 We had meant to stay in Agnes Water for just for a day or two but as the rain set in, the road which would have taken us north flooded and so we were stuck there for around five days. Although a pretty little town, there wasn’t much to do with the daily downpours. 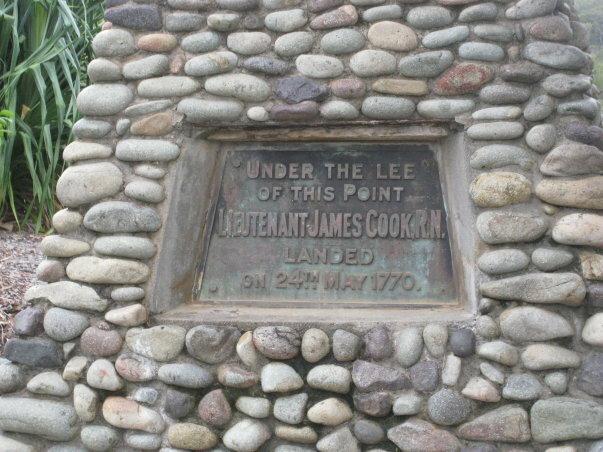 When the rain did let up briefly, we hired out bikes and cycled to 1770 to see the site of the second landing of James Cook. Once that was ticked off the agenda, we were basically just waiting for the road to clear so that we could carry on our adventure. It was a fun night but I still couldn’t quite warm to them, so as soon as the road cleared, we packed our bags and I gladly waved goodbye.